HESI Power Zyme is a cellulase extract from the trichoderma fungus (a so-called ascomycete, or also ascomycota), which decomposes the cellulose of dead plants into recoverable dextrose. This dextrose serves as nutrition for roots and for soil flora. 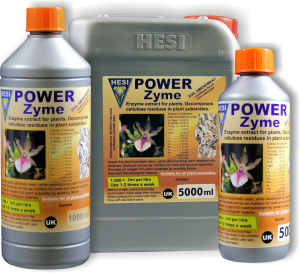 HESI Power Zyme, a soil additive based on trichoderma cultures. with almost no nutritional components. The following table shows that there are no additional fertilisers or metals.